South Africa President Cyril Ramaphosa's wishy-washy stance on the ANC's resolutions, including expropriation of land without compensation, will be used as a basis to remove him at the party's national general council (NGC) in June next year. The move will see Ramaphosa's deputy, David Mabuza, replacing him. These claims were made by EFF leader Julius Malema during the party's media briefing in Braamfontein, Johannesburg, on Wednesday. Malema said an internal rebellion against Ramaphosa was brewing within the ANC. "The reality of the situation is that Ramaphosa won't finish his term. The man is stuck. If [he] dares remove people from the list, they are working on the ground and they are talking to branches. The NGC will take place in June. He won't come back. I can tell you now," Malema prophesied. The EFF leader also warned white South Africans who will vote for the ANC that Ramaphosa is going to be removed. "DD [Mabuza] is going to be put in as the president. We are in trouble." 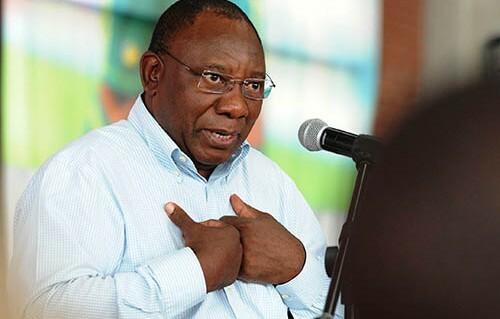 The ANC's Gauteng internal research poll revealed that the party's support among white people had increased since Ramaphosa was elected ANC president in 2017. Malema said there was an "arrogance" among white South Africans because they regarded Ramaphosa as "their man". "Cyril is not a Pan Africanist. He has a pro-white agenda. That is why there is a huge increase in white arrogance," he said. "We wanted to amend the Constitution as in yesterday, we are very clear with what we want to do. The ANC, when they meet white people, they speak DA policies and when they meet black people, they speak EFF policies. There is a general confusion in Thuma Mina, their land position is confused. We do not want to work with the ANC because they are confused," he said. Malema said the confusion around the direction which the ANC should take has given Ramaphosa's enemies ammunition to remove him. He also claimed that the United Democratic Front "cabal", which is now in charge of the state, may be behind the book about ANC secretary-general Ace Magashule, titled Gangster State: Unravelling Ace Magashule's Web of Capture. The launch of the book, authored by Pieter-Louis Myburgh, was disrupted in Sandton on Tuesday night. On the Alexandra shutdown, Malema said the protests were sponsored by the ANC and was part of the party's election campaign strategy. "There is no mess created by the DA. The only problem is that the DA did not do anything about the mess they found there. The Alex mafia must tell us where the Alex renewal project money is." But Malema also criticised Johannesburg mayor Herman Mashaba for failing to meet with Alexandra residents. He said Mashaba should have gone to Alexandra and be humiliated. "If you want to be a leader, don't be scared of being booed." "I am not begging white people to stay here. They have got two passports. They are half South African and half British. They can leave quietly." Malema also revealed that EFF MP Thembinkosi Rawula had tendered his resignation from the party. Rawula has alleged that Malema stole EFF funds. Malema said he was suing Rawula, who was not included on the EFF parliamentary list, for R1 million. "I am taking him to the cleaners. If the court says [to me that I should] produce [a] bank statement to show you I am not taking the EFF money, I will do that," he said.